Among the pros of a gold standard, there is one that could have prevented Trump from bombing the Syrian airbase. First, the summary of the event that covered the world with some goose bumps. Actually, this is the first time in six years of Syrian war that the US directly intervened. Barack Obama avoided the country. What were the reactions of the most relevant parties and the world in general? They said that the strike didn’t do a lot of damage to the base and it was “foolish and irresponsible”. 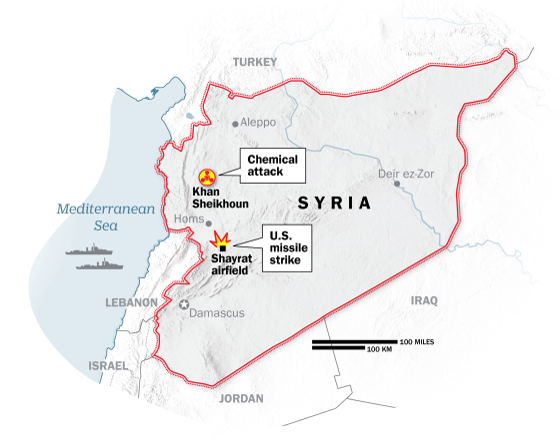 They insisted that the Syrian government had no chemical weapons. In addition, they said that they will further strengthen the efforts against the rebels. President Vladimir Putin called it an “act of aggression”. While prime minister Dmitry Medvedev said that this “completely ruined relations”. They also added that the US has no evidence that the gas originated from Shayrat airbase. Moreover, they promised to bolster Assad’s air defenses. Well, they felt very content with the bombing of Assad’s side and want more. Here are their words, posted on Twitter “Hitting one airbase is not enough – there are 26 airbases that target civilians. The whole world should save the Syrian people from the clutches of the killer Bashar and his aides”. The leaders of UK and Australia as well as Israel and Saudia Arabia approved Trump’s actions. Italy and Japan empathized with Trump. A series of protests were organized on the streets of US cities with the “Hands off Syria”, “No more war based on lies” and similar placards. A lot of people request independent investigation of the site where the gas attack happened. Apart from the efforts of mass media, people don’t believe that the attack was done by Bashar al-Assad. This gives comfort – people start to question what they hear on the news. Finally, the one who ordered the strike on Saturday twitted “Congratulations to our great military men and women for representing the United States, and the world, so well in the Syria attack” (just wondering what it means when statements such as this are shared via social media not tongue?). Yeah, congratulations for contributing to and promoting violence and misery. Again. The world is backwards. Sometimes I even get an impression that the matrices where such hypocrisy and manipulations originate from are a little confused and disoriented themselves. Okay, everything that I summarized above is according to the CNN, the New York Times, the Guardian and the like. If there is 40% truth in their news reports, that’s decent (anything could have been fabricated). But enough talking about that. After all, everyone sooner or later answers for their deeds; whatever they are, violence, lies, hypocrisy. So, going back to what I mentioned at the beginning of the post. How a gold standard could have possibly prevented Trump from bombing Syria? Not hard to guess I think. First of all, interventions such as this have a big price tag to them. Overall, military actions and all matters tied to military cost a lot. That includes basic national defense at home. If the US was on a gold standard, there is no way it could have afforded to settle down and participate nearly in every armed event on the planet, keep and maintain its countless military bases, etc. See for yourself: since 1971, the US has added literally hundreds of military bases. According to the 2015 statistics, it has almost 800 military bases in 70 countries. Way, way more than any other country. To visualize the difference – Britain, France and Russia combined have only 30 foreign bases. About 40 out of those 800 are active, meaning located in war zones and fully functioning. The cost of keeping and taking care of all foreign bases and troops? It’s about $160 to 200 billion per year. The US government could have never been able to back up these gigantic sums with gold! What’s more, is that overall, since 1971, in the last 46 years being off the gold standard, the US has been involved nearly in three times as many military conflicts than in the last 46 years being on the gold standard (from 1925 to 1971)! Fiat money enable[s] government to maintain an easy war policy… To be truly opposed to preemptive and unnecessary wars one must advocate sound money to prevent the promoters of war from financing their imperialism. Everything I just talked about but in a few words? A monetary system based on a gold standard puts a break on how much a government can spend on military. Naturally, this equates to less military events and wars. A big deal, don’t you think? A gold standard in place = less violence and death = a happier world. And a happier world is that thing that is desired by all good-natured people… I hope. P.S. Honestly, I kind of sympathized with Trump but now most of the feeling has vanished. Somewhat disappointing. I might be wrong in some ways.